Miami Beach 411 > Hotels > 3-star Eden Roc Hotel in Miami Beach, FL. ¿Hablas Español? ABOVE: An animated video of the Eden Roc Hotel. Watch more hotel videos. This page allows you to watch a video, find directions, post a comment, read reviews, and check rates at the Eden Roc Hotel. Rates: Low season from $149. High season from $220. Since 1956, the legendary Eden Roc Resort has graced Miami Beach's Millionaire's Row. The 4-star oceanfront hotel and spa was designed by famed architect Morris Lapidus, . It became an immediate landmark, setting a new standard for oceanfront hotels. With its array of activities and a state-of-the art oceanfront spa, it has been known to attract the nation's top entertainers and celebrities. This four star, three dimond property offers spacious, guest rooms with exceptional views. Most of the guest rooms have water views. 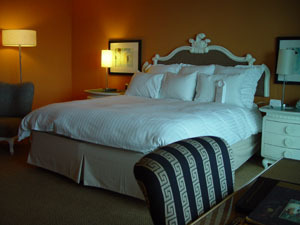 King size beds are in 33% of rooms. Rooms with two beds all have two queens. The Eden Roc participates in Wired for Business - Marriott's new service that includes high speed Internet access plus unlimited local and long distance telephone calls within the - USA $10 per day. Click HERE for Eden Roc Lodging Information. • The Eden Roc is on the Right (East) side of the street. 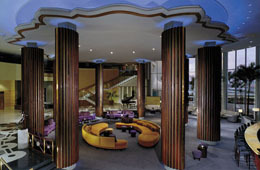 The Eden Roc is located at 4525 Collins Ave., Miami Beach, FL 33140. Use our Miami hotel map to find the exact location. Eden Roc Hotel "Open Mind"
The reviews I read were mixed so I did as I always do and traveled with an open mind. As for my experience at the Eden Roc, it was great. The rooms were large, comfortable beds, very spacious closets. The staff was very friendly and helpful. All (including the bellman) knew the area and gave great directions. We traveled with our grandson and his friend and they are still talking about the great time they had. The staff even gave them directions to the "action" on the beach. Everyone's experience will be different. The main thing is to ask, let the staff know if you need something other than what you see, be pleasant, and keep an open mind. Eden Roc Hotel "Great Spa Experience"